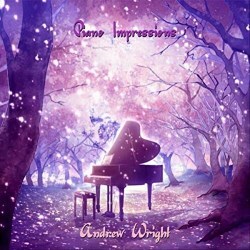 Andrew Wright, whose Divine Art disc called The Operatic Pianist was favourably reviewed here (review), has now produced his own disc. Its cover art sets the piano in what looks like a magical forest irradiated by light. The compositions are all his and have been captured, largely, live in recital in Edinburgh and also Dundee, and are structured around his Concerto for solo piano with some improvisatory pieces before and after. The Concerto is in three movements and was recorded in concert in 2017. It reflects some of the major influences on Wright, an eclectic admixture of Alkan and Liszt with Rachmaninoff and also - though Wright might baulk at this – Addinsell. In the central movement Chopin is the motor, the decorative runs not quite preparing the listener for the Dies Irae jolt of the finale, brooding Lisztian paragraphs that reflect on themes from the opening movement to complete the circle. Of the eight remaining pieces six are improvisations. Warmup is precisely that, a pre-concert way to get the fingers working and they do this overtime – Rachmaninovian powerplay leads on to florid Lisztian declamation in quasi-operatic style; the treble is pipy, the bravura breathless. Melancholia’s lugubriousness hints at a Rachmaninov Prelude in moody growling fashion whilst Melodrama enjoys passionate chording. The piano used in the 2015 recital for Nocturne sounds in far less good state than those in the other recitals though the piece is both expressive and virtuosic. Appassionata continues the dual lineage from Liszt and Rachmaninov, elements that are, from time to time, too easily employed successfully to differentiate the pieces. The last two pieces are not improvisations. Elle’s Poem suggests a Lisztian narrative, moving from gauntness to expressive amplitude and Tetris Fantasy – at first I misread this as a fantasy for the viola player Lionel Tertis – offers a paraphrase of the video game. Wright then co-opts the styles of his musical fathers – Chopin, Liszt, Alkan, and Rachmaninov included. The location recordings can be variable as are the pianos employed, or their condition. Wright’s brief one-page booklet note is very honest about his musical antecedents. The no-nonsense, cut-to-the-bone booklet is certainly no bar to enjoyment of this piledriving disc.